The explosions rocked Brussels. But they rocked me too. I was in Dubai and had just sat down at a meeting. The guy said to me, “did you hear about Brussels?” I hadn’t and quickly jumped on the Wi-Fi and looked at the first stories trickling out. The meeting lasted another ninety minutes and then I went back to my hotel, turned on the television and watched the BBC to see what was happening. I flipped the station and there was George Stephanopoulos (for some reason they had ABC). I searched through the Internet at the same time absorbing whatever I could and I sent messages to friends and colleagues in Brussels to make sure they were ok. I was in New York City for September 11th and remember the world’s reaction and the support that came afterward. After Paris, I sent notes of support to friends. Brussels just felt a bit different. I was not at home. I was going to have to fly through London for a meeting before coming back to NYC. Airports. Train stations. Taxi rides. They were all in my future less than 24 hours away. 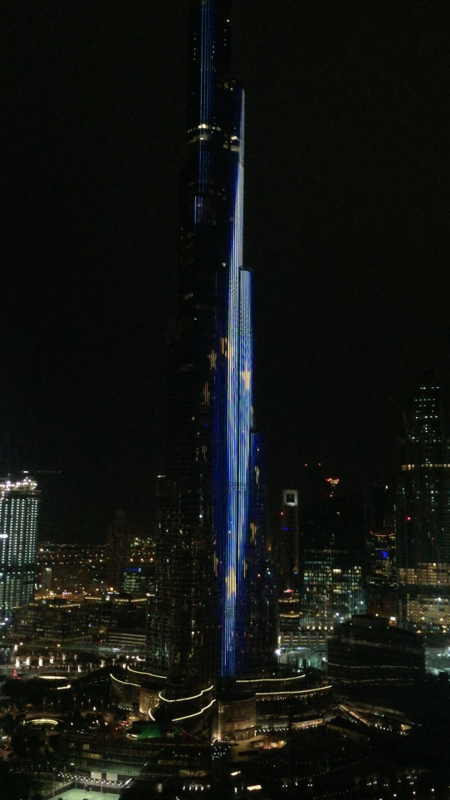 The Burj Khalifa was lit up with the EU and the Belgian flags – showing support for a shaken continent and nation. But I still had to go to the airport. When I was checking in the computer system went down for British Airways. 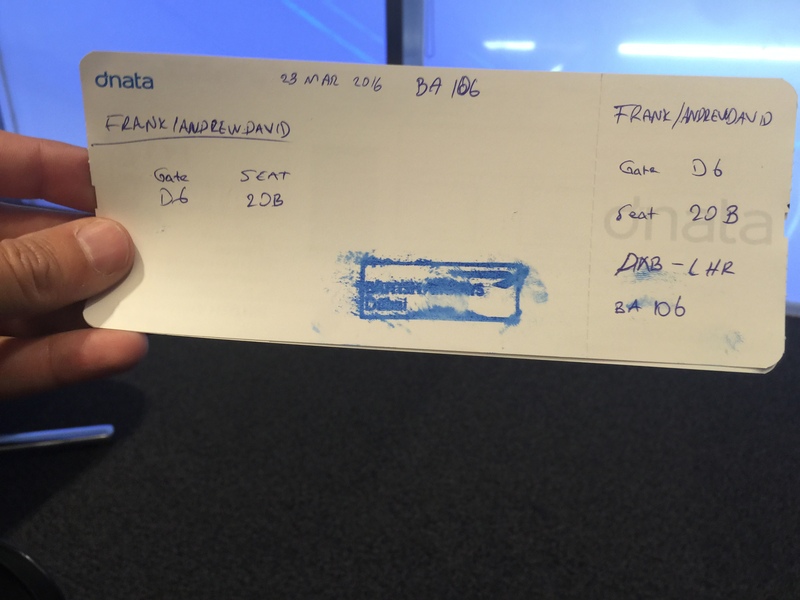 They had to handwrite our boarding passes! Thousands of people were in long lines at the terminal waiting … sitting ducks in some way! While I know the British have experience and intelligence with terrorism far above the Belgians and the French, it was still a nerve-racking time. I sat in the British Airways lounge in Dubai next to a woman who was crying. She was supposed to fly home to Brussels, but was on her way to London because that is the closest she could get – not knowing when she would be able to get home to see her friends and relatives. She was saying that so far she didn’t know anyone who was dead or injured, but she was still shaken and complained about the Brussels anti-terrorist capabilities and the way the extremists have “infiltrated” her country. We boarded. We flew. We landed. I went through the arrivals area and saw signs posted that asked, “if you saw anything in Brussels, please contact XYZ.” I walked to the Heathrow Express. I looked around for more visible signs of security. I took the train and then a cab to my meeting. A few hours later I did the reverse to get back to the airport and my flight home. I looked for gloves on the hands of people who looked a bit suspicious. I walked a bit faster. I flew to JFK and landed. I got into my cab and then home at about 10pm, after driving right through a crowded Times Square. I woke up early this morning and walked across Times Square to go to my office. I passed people, police and cheering crowds in front of Good Morning America (Ben Affleck was there to promote Batman v Superman). People. Targets. Living their lives. Terrorists prey on fear. They want us to do things differently than we did before. They want us to live afraid. We must not give in. We must be vigilant and we must support the efforts of all those who are protecting our safety. We must also not stereotype. But I know that I will be looking around more carefully, walking a little faster through crowded spaces, and now looking at people’s hands. The world has once again changed.